SMC Training module,Karadeepika,TS SMC Trainings to SMC Committee & PRI Members, Dates, Guidelines 2018: TSSA is proposed to conduct School Management Committee Members and PRI members for the year 2017-18. At Mandal level 26.12.2017 or 27.12.2017 vide reference lst and 2nd cited below. But the planning wing of TSSA, Hyderabad is issued a planning Scheduled for 2017-18 to conduct District level orientation to Mandal Planning Core Teams and on below mentioned date orientation to Habitation Planning core Teams at mandal level and issuing plan formats to HMs as treating an important one. Trainings :: Mandal Level 27.12.2017 :: 1 Day :: School HM, SMC chairman, PRI members/ Vice chairman. They are requested to take necessary action in the matter accordingly. C and DSE Telangana - Rc.No.C.No:382, Dated:25-01-2017 :: Sub: Telangana SSA Hyderabad -Trainings to the School Management Committee Members and PRI members- 2016-17- postponement of Mandal level SMC trainings from 27.01.2017 & 28.01.2017 to 30.01.2017 & 31.01.2017-orders-issued- Reg. l. This office Proc.Rc. No.382/CMO/T8/TSSA/201G Dated.I l.01.2017. 2. Lr.no. 99/BS/SMC/2017, dt: 17.01.2017 from DEO,Kamareddy. The attention of all the DEO & Ex-Officio Project officers in the State are informed that the TSSA is proposed to conduct School Management Committee Members and PRI members for the year 2016-17. At Mandal level 27.1.2017 I 28.01.2017 vide reference lst' and 2nd cited above. But the planning wing of TSSA, Hyderabad is issued a planning Scheduled for 2017-18 to conduct District level orientation to Mandal Planning Core Teams and on 28.01.2017 orientation to Habitation Planning core Teams at mandal level and issuing plan formats to HMs as treating an important one. In view of the above, now it is proposed to conduct Mandal level School committee Training programs on 30.01.2017 and 31.01.2017 as per the Norms mentioned in reference lst and 2nd cited above. Therefore all the DEO & Ex.o DPO in the state arc requested to conduct SMC Training at Mandal Level on 30.1.2017 and 301.01.2017 and submit the participants particulars in the prescribed proforma provided by State office without fail on lst February 2017. DEO MHBD - Proc. Rc. No. 1384 :: Date:28.01.2017 - Sub: School Education - Trainings to the School Management Committee Members and PRI Members - Issuing of guidelines Reg. Ref : 1. Rc.No.382/IE/T8/TSSA/2016, Dt: 11.01.2017 of the Director of School Education and Ex-Officio SPD, SSA, TS, Hyderabad. 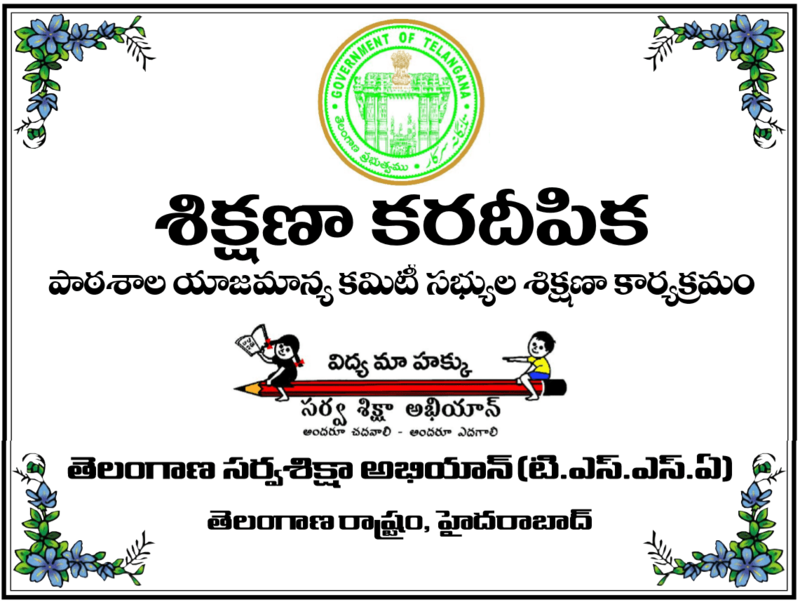 All the Mandal Educational Officers are hereby informed that in the reference cited, the Director of School Education and Ex-Officio SPD, SSA, TS, Hyderabad has informed that it has been proposed to conduct trainings to the school management committee members at mandal level and communicated the guidelines and unit cost on conduct of trainings at mandal level. Trainings to the SMC/PRI members should be conducted only on 26.12.2017 or 27.12.2017, which is convenient to the participants as per the time table enclosed. The Course Director at mandal level must inform through CRPs & concerned HMs to all the Participants in writing well in advance. Course Director/ Mandal Educational Officer, shall conduct the training programme at mandal level in a suitable venue. Sarpanches and other Public Representative, Philanthropists shall be felicitated at the trainings. Resolution may be made to announce to make the villages as OSC free villages. Donors list shall be prepared and should be written on the schools. Training to the PRI members/ SMC members should be treated as very important activity to take keep change in Gross root level on Education System and Implementation of RTE 2009. SMC members and PRI members shall be motivated towards the schools for as responsible personnel to achieve targets i.e., Bangaru Telangana. The training programme must be documented.